Irish angel Christmas tree topper with shamrocks features fiber optic illumination; she may also be used as a centerpiece. This Irish angel tree topper ights up! Her shamrock dress, wings and bouquet are continuously changing colors! This Irish Christmas angle features fiber optic lighting and she may be used as a tree topper or as a centerpiece. The Irish angle tree topper features red hair and a shamrock dress: the electric adapter is included. The 12" tall Irish angel topper is made of fabric and porcelain and is gift boxed with a shamrock history card, complements of The Irish Gift House. The Irish Christmas angel UL listed. 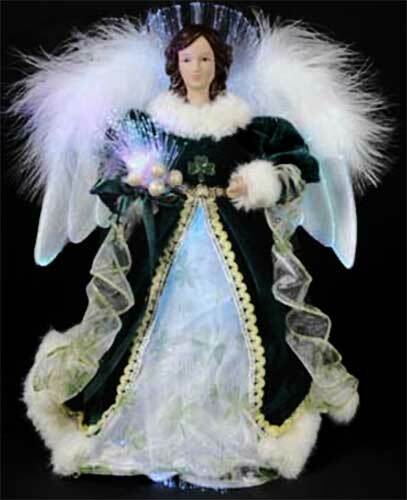 Irish Christmas tree topper is an illuminated angel that features a shamrock dress.